28.03.19 : WNHWA table display at Waitrose supermarket, Marlow Hill (Handy Cross), High Wycombe, from 10.00 to 12.00 hrs. 29.03.19 : GP to address AGM of Fair Ridge & The Spinney Residents Association re cons & scams at Wycombe Leisure Centre from 8.00pm. 04.04.19 : GP to address Bucks Vision re cons & scams at Hazlemere Community Centre from 2.30pm. 10.04.19 : GP to address Communities That Care Meeting re cons & scams, at Adams Park, High Wycombe, from 10.00am. 02.05.19 The Annual General Meeting of Wycombe District Neighbourhood Watch Association, which will be held at the church of Christ the Servant King, Sycamore Road, Booker, High Wycombe HP12 4TJ on Thursday, 2nd May, from 7.30pm. The church is on the corner of Cressex Road and Sycamore Road. It has its own car park in Sycamore Road. Following the official business of the AGM, we are delighted to have these guest speakers: Korinne Leney, Area Manager, Community Engagement & Development Communities, Bucks County Council; Inspector Pete Wall, Neighbourhood Inspector, Wycombe Local Police Area. 06.06.19 : GP to address Lane End Older People’s Action Group re cons & scams at Lane End Community Centre from 2.00pm (as a public meeting). 25.09.19 : GP to address U3A re cons & scams at Lacey Green Millenium Hall from 2.15PM. 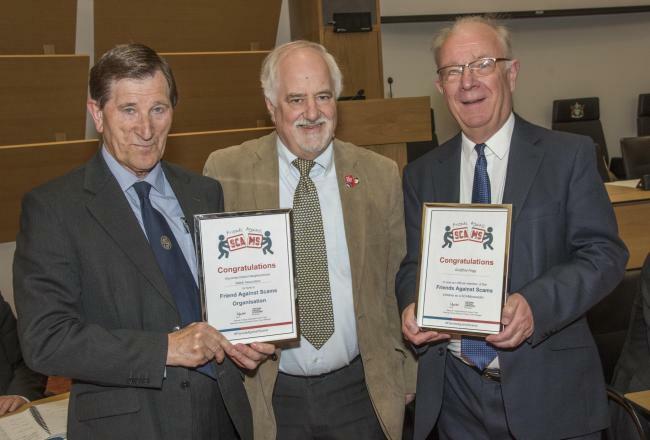 Geoff Pegg, director of operations at the Wycombe District Neighbourhood Watch Association, and Stan Jones, Chairman, were presented with certificates at Bucks County Council’s AGM on 17 May 2018, registering the group as an official Friends Against Scams organisation. The presentation also recognised Geoff’s personal commitment to the cause and his work in overseeing the training of members of the High Wycombe group to proactively go out and speak to local communities about how to protect themselves. Meeting at Godstowe School, October 2018. As well as visitors having the opportunity to raise issues and concerns in their areas, we were pleased to welcome guest speakers: Sarah Woodward, Training Lead for One Recovery Bucks, the adult substance misuse service for Bucks; and Robin Mugridge, Scheme Co-ordinator of High Wycombe First Responder Scheme. Many thanks to our speakers and everyone who attended. WDNHWA is delighted to announce that a new NHW scheme has been started for the 4000 students of Bucks New University who live in the town. Despite the relative safety of our district for students, they are often targeted by thieves and it is hoped that this scheme will help keep them as safe as possible. This is by far the largest NHW scheme in Wycombe, and it is run by the Volunteers Department of the Students’ Union, who aim to extend it to those elsewhere in the district very soon. WDNHWA has a table display of useful crime prevention leaflets outside one of the main mosques in High Wycombe (Jubilee Road, Castlefield, & Totteridge Road) by rotation, overlapping the time of Friday prayers – weather permitting during the summer, spring, and autumn. If there is something you would like to see featured on this page please let us know!